thin scrim of mist, drifting white clouds. summer sky; its wan reflection bleeds across distant waves. landmarks, activities of the living, all concealed. shadow, blurred mirage of a passing ship’s bow. 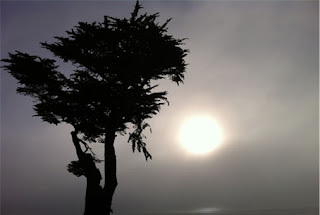 chill fog ascends, and unfettered light pours. This is about a fine as a poem can be, tight and tough.